It all started in January 1913 with the birth of our founder Charles W. Moyer Sr. At about the age of 10, he discovered he had a real interest in this new invention called radio. You see, nobody used the term "Electronics" then, it was simply called radio. After experimenting and building a couple of crystal radios and then one-tube radios, a very young Charlie persuaded his school teacher to allow him to do a fund raiser to buy the components to build a radio for in their classroom. He could then share with his classmates this wonderful new invention of radio that many of them had never seen or heard. After selling enough Hershey chocolate bars, my father obtained the parts needed to build a radio so they could experience the same magic he felt when you would hear programming coming from this new form of technology. After graduating from high school in 1931, my father's dream of going to college to become an electrical engineer was dashed by the great depression. His father was an engineer, but of a different type, a locomotive engineer for the Reading Railroad. Unfortunately that didn't provide the means for him to further his education. So learning all he could through a home study course on radio, he then took a job in a radio repair shop called Jones Radio Company in Pottsville PA.
During the 1930's my father studied to get his first class radiotelephone operators license to allow him to become an engineer at a radio station. After doing so, he worked at both of the Pottsville radio stations when he wasn't repairing radios, installing car radios, repairing juke boxes, or operating his amateur radio station. Near the end of the 1930's my father decided to purchase the company from his employers. It was a big decision because the country was still in a depression, and money was very tight. But, with radio growing in popularity he felt with a lot of hard work and determination, it was a good chance to take. Then, as we all know, in December of 1941, World War II broke out. Radio then became something of extreme importance to everyone. It didn't matter who you were, you wanted to hear the latest news on what was going on with the war as you prayed for the safe return of a husband, son, father, brother, sister, or daughter. This created new challenges for radio repair technicians as the government was placing restrictions on everything including which radio parts were to be sold for the purpose of repairing radios. Due to the fact that so much of our nations production of components was going to build equipment for the war effort, and no new radio sets were being manufactured, repair men had to get very creative on how to make these few items function so folks could tune in to hear the latest news, or get a little entertainment to take their minds off it. Many of the parts manufactured during those years, mainly tubes, actually had the two letters printed on them "M-R". That meant "maintenance or repair" and that they dare not be used for new sets but only for the repairing of existing sets. My father often remarked that they felt that meant "Military Reject." Then finally, in 1946 the war was over and things got somewhat back to normal. During the war many things progressed at a more rapid rate than usual, and electronics was surely one of them. What this meant was that the widespread use of radar during the war helped this "thing" people were just experimenting with before the war broke out to advance much more quickly. This "thing" was called television. Often during the years that he was repairing radios my father would sell parts that he had bought for his shop to other repair men. In 1947 my father said he felt he had to make a decision whether to do one or the other, repair radios or sell parts for them. After thinking long and hard about it, he decided to stop repairing and turned his efforts to selling. With television sets selling at a very rapid rate, the need for things like antennas and accessories, as well as repair parts, subsequently grew. My father was now looking to expand his business. One day while walking down Broad St. in Hazleton, my father thought this would be a good town to open a store. 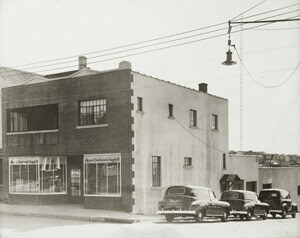 So he purchased a building at 758 N. Locust St. and opened his second store there. For quite a few years my father traveled northeastern and central Pennsylvania selling to repair shops. In one town he had numerous requests by repair technicians to open a store. This town was Sunbury. 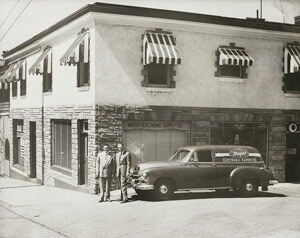 This store was opened in 1953 at 5 Haas Ave. This location wasn't ideal, but in the 1950's when Sunbury was a bustling city there wasn't much to be had in vacant storefront properties. 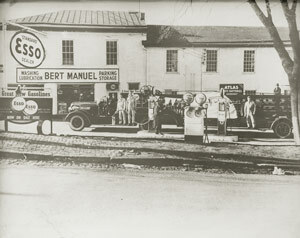 Then in 1955 the store was moved to 310N. Second St., where it still is today. The man who's desire to provide good service, and quality electronic components and equipment, passed away Sept. 16, 2000. While we miss him terribly the values he instilled in his staff are still alive and well with us today. So if you're looking for a small electronic parts and equipment supplier who's big on customer service come see us. 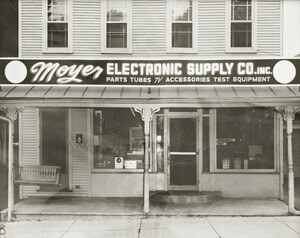 We hope you'll find your shopping experience at Moyer Electronics a positive one and you will tell your friends to give us a try. Oh, and by the way, if you are looking to repair your classic (old) electronic equipment, we still have many of those items in stock, even some with that M-R markings. Just let us know if you'd like it with or without its original patina (dust)! We still miss you Dad!